Send Royal Family KIDS Packing…. to camp, that is! The primary purpose of Royal Family KIDS Camp is to give foster children, ages 7-11, a week of positive memories in a Christian environment. North Bend Church of the Brethren Women’s Fellowship (Clear Fork Branch) has chosen to stand alongside volunteer counselors and staff to make these memories a reality. We would like to “send one Royal Family KIDS packing” and have selected the Living Color Fundraiser ‘Think Spring’ program as a method to help us reach our goal of $1325 in total sales. This amount, with an average profit margin of 34%, would equal the $450 needed for one KIDS camper sponsorship. 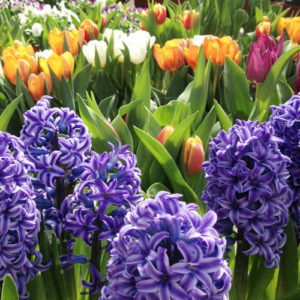 Living Color Fundraiser Program, a natural, healthy way to solicit funds, offers 37 plants in six categories from C. Raker & Sons (Litchfield, MI). Raker is a premiere commercial wholesaler of young and finished plants to the horticulture industry. To learn more, the brochure explains about each plant’s flower or harvest time and its need for exposure to sun or shade. We appreciate your generosity. Your support will help KIDS, served by compassionate counselors and staff in a Christian environment, create positive camp memories now that can change their lives for tomorrow. Thank you! Celebrate Valentine’s Day on Feb. 12th with us! Start off by joining us for services at either site! Join us for a Carry-in Meal at Danville following the services at 12:00. Please bring your favorite dish (or 2) to share! Then support the youth group at their Love & War Fundraiser! Dinner and Entertainment will be provided! The fun starts at 6pm!